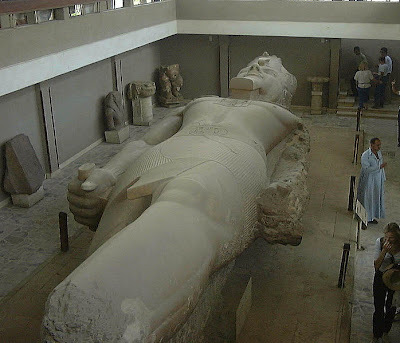 As a monument builder Ramses II stands pre-eminent amongst the pharaohs of Egypt. Although Khufu had created the Great Pyramid, Ramesses' hand lay over the whole land. 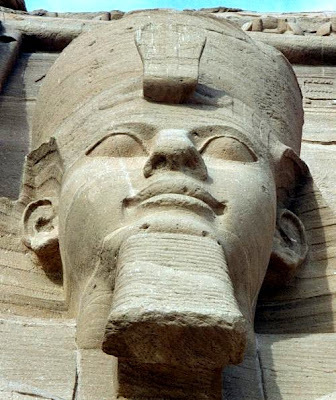 True, he thought nothing of adding his name to other kings' monuments and statues right back to the Middle Kingdom, so that nowadays the majority of cartouches seen on almost any monument proclaim his throne name - User-maat-re ('the Justice of Re is strong'). Yet his genuine building achievements are on a Herculean scale. He added to the great temples at Karnak and Luxor, completed his father Seti's mortuary temple at Gourna (Thebes) and also his Abydos temple, and built his own temple nearby at Abydos. On the west bank at Thebes he constructed a giant mortuary temple, the Ramesseum. Inscriptions in the sandstone quarries at Gebel el- Silsila record at least 3000 workmen employed there cutting stone for the Ramesseum alone. Other major mortuary temples rose in Nubia at Beit el-Wali, Gerf Hussein, Wadi es Sebua, Derr and even as far south as Napata. Ramesses' greatest building feat must be counted not one of these, but the carving out of the mountainside of the two temples at Abu Simbel in Nubia. The grandeur of the larger, the Great Temple, is overwhelming, fronted as it is by four colossal 60-ft (18-m) high seated figures of the king that flank the entrance in two pairs. It is strange to reflect that whilst the smaller temple, dedicated to Hathor and Ramesses' favourite queen Nefertari, has lain open for centuries, the Great Temple was only rediscovered in 1813 by the Swiss explorer Jean Louis Burckhardt and first entered by Giovanni Belzoni on 1 August 1817. A miracle of ancient engineering, its orientation was so exact that the rising sun at the equinox on 22 February and 22 October flooded directly through the great entrance to illuminate three of the four gods carved seated in the sanctuary over 200 ft (60 m) inside the mountain (the fourth of the seated gods, Ptah, does not become illuminated as, appropriately, he is a god associated with the underworld). Nefertari was probably present at the dedication of the two Abu Simbel temples in Year 24 (1256/55) and apparently died the following year, so at least she saw herself associated with her husband in his greatest work and lived to see the dedication of her temple. One of Ramesses' preoccupations in all this building work was obviously the payment for it, and that meant gold. The precious metal is represented as being brought as 'tribute' in many Theban nobles' tombs of the 18th and 19th Dynasties, and a papyrus in the Turin Museum from the reign of Seti I actually shows a map of goldmines in the eastern desert. A lot of the wealth was also diverted into the costs of building a fine new city in the Delta, Piramesse ('Domain of Ramesses'), near modern Qantir. Embellished with great obelisks, Piramesse became the wonder of the age - though little alas remains today - and it was probably on such building works that the Hebrews were employed in the 'land of Goshen'. The Exodus apparently took place from this area in about 1263-62, Year 17: And it came to pass at the end of four hundred and thirty years . . . that all the hosts of the Lord went out from the Land of Egypt’ (Exodus 12:41). Although a traumatic experience for the Jews and a major element in Judaism, it was not recognized as such in Egypt and the only known reference to Israel in the Egyptian record occurs under Merneptah.